Last year, my wife, myself, Shari & Brad, Lonny all spent a few days hiking through the backcountry to Mount of the Holy Cross and the 4-Pass Loop through the Maroon Bells-Snowmass Wilderness. We'd discussed tackling a few of the collegiate peaks this year, so Mt. Harvard and Mt. Columbia were our targets of choice. We'd gotten a good look at Mt. Harvard last year from the summit of Mt. Belford, and we were looking forward to tackling this third-highest peak in Colorado (since all of us had done numbers 1 and 2). Unfortunately, my wife had to bow out due to a knee injury, which left Shari, Brad, Lonny, and myself to tackle these beasts. Finding the trailhead was not tough - we had good maps and followed the directions in Gerry Roach's Fourteeners book. I was surprised, however, to see that the road quickly degraded into a pretty rough shape. Usually Roach is good at calling out roads that require high-clearance vehicles, but he makes no mention of the challenge of this. At the trailhead, we saw a Honda Civic and a Ford Taurus, so obviously the road was passable to passenger cars, but after driving over it in a 4Runner, I wouldn't want to do it in my sedan! Leaving Denver around 10:00am and stopping in Buena Vista for lunch, we arrived at the trailhead around 1:30pm. The parking area around the trailhead was packed with cars and people camping, but we managed to find a place to park okay. We set out around 1:45pm along the very solid trail. A friend had told me that there were a lot of good campsites just below tree line which appeared to be at about 11,600 feet, according to our maps. Starting at around 11,000 feet, we started looking for a good place to camp and found a nice large clearing set back from the trees and near a stream (38.882 N, -106.309 W) which suited us perfectly. We threw down our packs and explored up the trail about half a mile further just to see if there was anything better up ahead. Not seeing much, we returned to our spot and set up camp. It had taken us a little under 2 hours to cover the 2.8 miles we'd hiked to camp. As expected, we could here nearby thunder rumbling from the standard afternoon storms that regularly hit the mountains. We'd realized while on the trail that the flies and mosquitoes were going to be an irritant on this trip. Brad and Lonny start counting their number of kills of both variety (Lonny hit 100 mosquito kills by about 7pm that night). Insect repellent was a must on this trip, as it is on most that I've been on. The day before, we had decided that we wanted to try tackling Mt. Harvard and Mt. Columbia on Sunday via the ridge that connected the two of them. The ridge (or rather, a few hundred feet below the ridge) was about 2 miles long and described as "arduous" by Roach, which didn't seem to bad a description at the time. In order to tackle both of these peaks, we left camp around 6:45am. We cleared treeline about 15 minutes, noting that there were a handful of good campsites along the trail just at treeline, but our site was one of the best we'd seen yet. (Incidentally, there are a lot of good campsites off the trail split that heads towards Mt. Columbia, however I didn't see nearby stream access). The sun was beginning to hit Mt. Harvard, as well as Mt. Yale behind us. We hadn't seen anyone else on the trail until about 45 minutes later, when we stopped to apply sunscreen (once the sun crested the ridgeline to our east). A group of two hikers caught up to us, and a group of two more was not too far behind. Overall, however, the trail was not crowded (compared to the Front Range 14ers). It was 3.6 miles from camp to the summit of Harvard. The trail was remarkably strong - I'd expected that we'd have to pick through talus to find hints of trails (much like many other Sawatch 14ers), but much of the trail was on dirt. The one large talus crossing (at about 12,800 ft) was well defined and marked with cairns. Our pace slowed a bit the higher we climbed, but we followed the solid trail until the final crux of the summit. This last bit surprised me. Where we had well defined trail the entire route, it suddenly stopped, and we had to scramble up the last 50 feet or so to the summit. In my mind, the final summit push was an easy class 3, however all the books describe it as a class 2. Either way, a dog that was with one of the other groups on the trail was not able to reach the summit given the need to scramble. The Harvard summit offered a fantastic view of the Horn Fork Basin below, as well as more 14ers than I've ever seen from a mountain. Within view as Pikes Peak, Columbia, Yale, Princeton, Antero, Shavano, Tabaguache, Snowmass, Capitol, Maroon Bells, Pyramid, Oxford, Belford, Missouri, La Plata, Huron, Massive, Elbert, and Holy Cross. I'm sure more were visible (the Mosquitos, for example) but were hazier and harder to make out! Our hike of Mt. Harvard took about 3 hours from camp (we summited shortly before 10am) - not bad for 3.6 miles and 3200 feet of elevation gain. Honestly, it was a delightful hike, and the final summit push was somewhat exhilarating. We rested for a few minutes on the summit, snacking and taking photos. The sky had faint wisps of clouds, but nothing building to serious storm clouds yet - a good sign. Lonny, Shari, and Brad had been turned back from La Plata the previous weekend due to a 10am thunderstorm! After resting, we started our descent down the ridge line towards Mt. Columbia. From the summit, there didn't appear to be a well defined trail across the ridge, but someone else on the summit with us said they saw a cairn on the left (north) side of the ridge. We saw a few cairns, but our time with a solid trail was clearly over. We picked our way through the boulders along the ridge on first the northern then the southern side (once the north had too much exposure). It was slow going, but passable. Eventually, we came to a portion of a trail which we followed while we could. It led down a steep embankment where one had to hold closely to nearby rocks to not slip down the slippery dirt path. We took our time descending (along with two other groups that left the summit the same time as us to head to Mt. Columbia) and managed to avoid sliding down too far. Eventually, the path gave way to a gentle grassy ridge line at around 13,500 feet. I'd made the statement that I thought the worst of our ridge crossing was over with, given the challenges of getting down the slick slope. I was wrong. According to the route I had, we were to drop down into the drainage between Harvard and Columbia to about 12,700 feet, then closely follow a contour line (12,800) below the top of the ridge in order to follow Class 2 hiking (the ridge crest is Class 5). We continued following the dirt trail we had along the tundra until it started to diverge from the route I knew we needed to take. The other two hiking parties continued to follow it up high around Point 13,516. Meanwhile, we broke off the trail to avoid getting trapped on a potential Class 5 ridge. We started heading down the grassy draw towards the valley floor, looking for any semblance of a trail that we could find - of which we found none. Brad descended a bit lower, looking for additional possibilities. Then we spotted the other two hiking parties we split from earlier. They were descending down Class 4 slopes on Point 13,516 towards some lines we could see in some small snow fields. Based on the lines (foot prints) and the direction they were going in, we were able to formulate a perspective traverse path that would avoid the treacherous parts of the mountain. We started heading towards the footprints we saw in the snow, and where the other hikers were heading. Since Brad was below us by about 100 feet, he followed a moderately grassy knoll upwards, occasionally scrambling over some boulders, while Shari, Lonny, and I traversed diagonally upwards across much looser and more dangerous terrain. The only thought that came to me (other than death via lightning or rock fall) was that I was not on a Class 2 climb anymore. The rocks we traversed on were all very loose and unstable. In hindsight, I believe descending to where Brad was (along the slightly grassy portion below Point 13,516) was the correct and safest route. Once at the snowfield, we followed the other hikers (now just a little in front of us) scrambling over large boulders. Most were quite stable, and the slope more forgiving. We started seeing a few cairns here and there, but they were scant. Looking back at a photo, I'm still slightly unclear of how we managed to traverse the slope without hitting the steep rock pitches or scree fields, but by picking our way through the alternating rocks and snowfields, we somehow ended up on the other side of the drainage by about 1pm. We stopped to rest on a grassy portion of the slope. Our elevation was about 12,900 feet and we were exhausted. 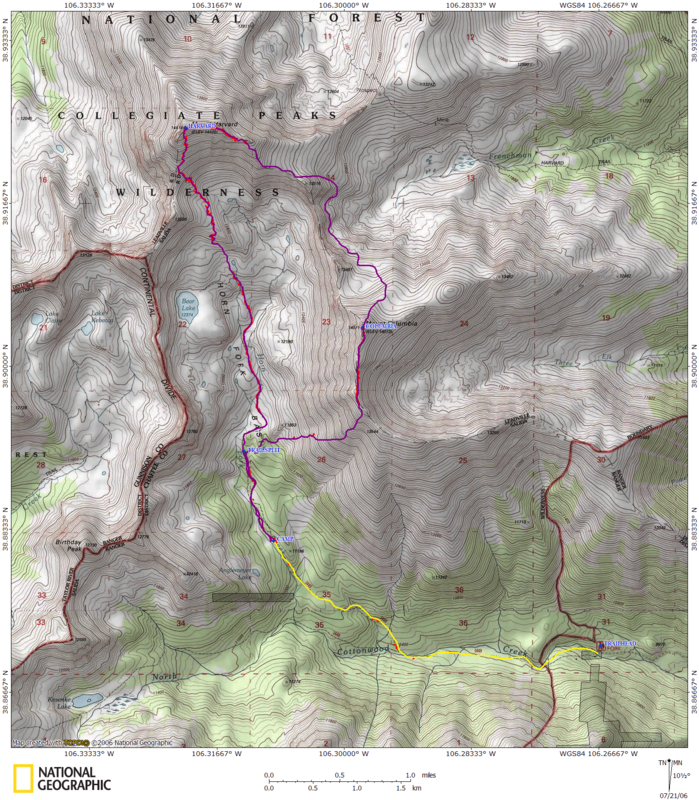 According to the route described in Roach's book, we were to angle southwest towards the crux of the ridge, and follow it all the way to the top of Columbia. This option didn't really look appealing. While it did cross a large gentle grassy slope, it finished with 700 feet of rock scrambling straight up to the summit. Instead, we followed in the footsteps of the same hikers in front of us instead and headed up a grassier (and slightly less steep) slope towards Columbia's northeastern ridge. At the ridge crest, some of the hikers continued farther up towards Columbia's east ridge, which looked to offer a shallower approach as well. We had decided that we were tired, wished to summit this thing so we could go home, so tackled the rocky northeastern head on, scrambling the last 500 feet on large boulders towards the summit. We finally reached the summit shortly before 3pm - about four and a half hours after we left the Harvard summit. Thankfully, the wispy clouds that we'd seen on the summit of Harvard never materialized into anything much more than an overcast sky. We hadn't heard any thunder yet, and none of the clouds were billowing up into the sky. We were exhausted - most of us had run out of water, since this traverse took far far longer than we had anticipated. The other hikers that we had followed were on the summit and we chatted a bit before another pair of hikers appeared. Their first comment upon summiting was, "That was not a class 2!" They had apparently been following our lead, just as we had followed those in front of us. We snapped the obligatory photo on the summit of Mt. Columbia but didn't dawdle - we were all tired and out of water, and wanted to get back to camp. We had 1.5 miles of trail left to go, and it didn't look pleasant. We headed south along the ridge line following faint trail indicators when we could. We arrived at a steep scree gully that the trail appeared to head down. Atop Mt. Harvard, a hiker had advised us to avoid what he called, "the scree field of death" that his pals had encountered once before and instead to continue farther down the ridge. Lonny thought he spotted more trail farther along on the ridge. Sure enough, on checking my GPS, it seemed as though we needed to keep proceeding farther down the ridge and not follow the false trail down the steep scree-filled embankment. On close examination of the route, we were to descend on a subtle shoulder of the ridge, not in a valley, so we pressed on about 100 yards further. We started seeing cairns and small orange landscaping markers driven into the ground - presumably to mark a "trail". The "trail" in question was a steep and very slick dirt track worn down from the tundra, weaving between football sized rocks, however it was marked with orange flags and cairns. Brad slipped multiple times along the top, as he didn't have trekking poles like the rest of us (they served us well on this descent). The slick and steep dirt wasn't pleasant, but it was better than the loose rock scramble that started our Columbia ascent, so I suppose it's all relative. Once we were about 12,450 feet, we started to angle down into the "scree field of death" and we spotted two of the hikers that we had been following earlier. We were below them just a bit, and they had departed the summit before us. We hadn't seen anyone on our descent route, and now we knew why: they had all headed down the scree valley, either by mistake or intentionally. From this angle, it was clear that the scree chute was a straight shot down the mountain. Our route offered an ever-so-slightly-less-steep descent, with mini-switchbacks. Perhaps "skiing" down the scree would've been preferable, but the steepness of the slope didn't look particularly appealing. As our trail took us into the scree field, the going got significantly steeper and much slicker. Every step seemed to bring a small bit of the mountain down with you - meanwhile all I could think of was the ecological damage that this "trail" had on the mountain...not much I could do about it at the time, I suppose. For the next 500 feet, it was slick and unpleasant. Lonny and Shari, who were above me, occasionally let loose small baseball sized rocks down in my direction, so I rapidly descended this section of trail to not get injured. From our vantage point, we could see the trail meander into the forest below, on the right-hand side of the valley opening, near a large outcropping of rocks. Eventually, after what seemed like a long time of sliding and bracing against our trekking poles, we were through most of the scree field and down at tree line. Following the trail, it meandered through numerous campsites until finally rejoining the main trail at 38.890 N, -106.312 W.
Once on the main trail, we still had about 0.75 miles to go till camp and to drop another 350 feet. We finally arrived at camp shortly before 6pm, making our entire excursion about 11 hours in length - much longer than any of us had truly expected. None of us had much energy, certainly not enough to pack out that night (which was only an idea, we'd all planned this as a three-day excursion). We made dinner, played a game of Scrabble, and heard the first crack of thunder of the day at around 8:15pm. It rained for about an hour after that - and I was thankful that no storm had materialized earlier in the day. We awoke Monday morning to a slightly warmer morning. Our tents and gear were a bit wet from the storm the night before, but not too bad. We ate breakfast, broke camp, and headed down the trail, returning to the car in about 1.5 hours, thrilled to be sitting in comfort and done hiking for the weekend. Overall, the Mt. Harvard trail was a delight - it was solid and easy to follow, plus the views on top were spectacular. The Mt. Columbia experience, however, was less than ideal. Roach's book states that "Some find Mt. Columbia a sufficient challenge by itself" - this is a phrase that most of us misinterpreted until we did it. The Harvard to Columbia trek was misery, but quite frankly, ascending the our descent route from the North Cottonwood trailhead seemed like it would be misery as well. If you attempt Mt. Columbia, I recommend an alternate route - the eastern ridge seemed to be the most gentle, if there was one.